Waiter: The gentleman has not arrived yet? Mrs. Claypool: No, he has not. Waiter: I'm afraid the dinner will be spoiled. Otis B. Driftwood: What difference does it make? It's too late to dine now. Otis B. Driftwood: Oh, boy? Otis B. Driftwood: Will you page Mr. Otis B. Driftwood, please? Mister Otis B. Driftwood. Bellboy: Paging Mr. Driftwood! Mr. Driftwood! Bellboy: [Driftwood's dinner companion giggles out loud] Mr. Driftwood! Mr. Driftwood! Q: How much was $9.40 worth when this film was made? 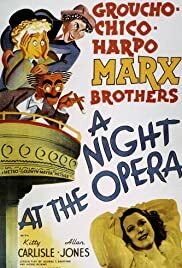 A NIGHT AT THE OPERA (MGM, 1935) directed by Sam Wood, re-introduces the Marx Brothers to the screen following their five years at the Paramount studio (1929-1933) to MGM, this being the start of a new beginning and the end to their wild world of comedy. It also brings forth their most popular comic foil of all, Margaret Dumont, from their Broadway to Paramount days, and the return to a formula story and time out for musical interludes either by the brothers or the romantic lovers originally done in their initial films of THE COCOANUTS (1929) and ANIMAL CRACKERS (1930). Aside from now being The Three Marx Brothers (Zeppo who has since retired), their characters have been toned down a bit, which helps. However, at MGM, with this, their best film for the studio, Groucho and Harpo become victims instead of instigators, with such notable scenes as Harpo employed as a dresser for an abusive opera tenor (Walter Wolfe King) who slaps, hits and uses a whip on him (at one point off camera) whenever getting out of line with his buffoonery, and Groucho, who always wins out in every situation physically and verbally, getting kicked down four flights of stairs, which indicates they are not always indestructible, yet remain in character from the old days whenever possible. Chico retains his wiseacre Italian character, remaining notably the same from his previous efforts, however, things will start to change not for the better for him and his brothers in the movies to follow. Plot summary: Introduction takes place in Milan, Italy, where Otis B. Driftwood (Groucho) agrees to represent dowager Mrs. Claypool (Margaret Dumont) into society by arranging for her to invest $200,000 to Herman Gottlieb (Sig Ruman), director of the opera company so that he can afford to bring opera singers Rudolpho Lassparri (Walter King) and Rosa Castaldi (Kitty Carlisle) to New York City. Rudolpho loves Rosa, but she is more interested in Ricardo Baroni (Allan Jones), an unknown singer working as a chorus-man, but with the help of Fiorelli (Chico), acting as his manager, and his partner, Tomasso (Harpo), the trio head for America by becoming stowaways on the S.S. Americus, hiding out in Driftwood's tiny stateroom in order for Ricardo to get his big chance as a singer. After Driftwood and his cronies arrive in at the Metropolitan Opera House, thanks to them in disrupting Rudolpho's performance that the art of opera will never be the same again. The musical program: "Alone" (sung by Kitty Carlisle and Allan Jones) by Nacio Herb Brown and Arthur Freed; "Cosi-Cosa" (sung by Allan Jones) by Bronislau Kaper, Walter Jurmann and Ned Washington; "All I Do is Dream of You" (by Brown and Freed/piano solo by Chico Marx); "Alone" (harp solo by Harpo Marx); and selections from Il Trovatore by Guiseppi Verdi: "Di quella pira," "Miserere," "Anvil Chorus," "Stride la Vampa" "Strido lassu" and "Miserere." Allan Jones and Kitty Carlisle doing their duet, "Alone," him on the pear and she from the boat dock, Chico's fast finger piano playing, and Harpo's harp solo in a serious manner as he performs to a little old lady (facial shadow front only) who looks on approvingly, may not be highlights, but are truly memorable moments. Highlights: Whenever anyone goes into discussion regarding A NIGHT AT THE OPERA, the first thing that comes immediately to mind is that famous state room scene involving Groucho, Chico and the sleeping Harpo, with various others involved, crammed together until the door opens, having them all falling out like dominoes. This hilarious bit is one that's remembered best with fondness and admiration. However, there are others worth noting: The opening where Dumont awaits for Groucho at a restaurant for an hour only to find him at the table behind her eating with another lady, is priceless; Groucho and Chico contract exchanges that becomes a "sanity clause"; arrested stowaway Harpo's attempt in escaping his detention cabin by crawling out of a porthole and hanging onto a rope outside only to be dumped into the ocean; Jones, Chico and Harpo in bearded disguises posing as celebrity aviators to give speeches on coast-to-coast radio, with the silent Harpo covering up his muteness by constantly drinking glasses of water; the disappearance of beds in Groucho's hotel room while the plainclothesman detective (Robert Emmett O'Connor) investigates; and of course, the climactic opera chaos by the Marxes, with one great bit with the orchestra playing the overture to "Take Me Out to the Ball Game" after coming to the page with the planted song sheets, with Groucho acting as a vendor yelling "Peanuts! Peanuts!" to the patrons. A classic with Callas. The supporting players: Newcomer Allan Jones steps in for the role that might have been offered to Zeppo. He is a likable actor with a fine singing voice who performs well opposite Kitty Carlisle (another recruit from Paramount and rare screen appearance, being best known as the TV panelist in the long running quiz show, "To Tell the Truth"). Footnote: It is quite evident that prints that have been circulating since commercial television days isn't complete. Missing footage is quite evident during the opening minutes of the story where the movie originally began with a musical number prior to the restaurant scene involving Groucho and Dumont. At present, this, along with other cut footage, no longer exists. Timed at 96minutes, the 90 minute version is the one available on Turner Classic Movies, VHS and DVD formats. Maybe one of these years a completely restored print of A NIGHT AT THE OPERA will suffice, but for now, this will have to do.